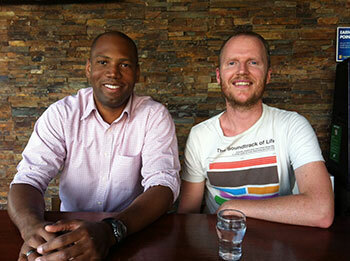 Science teacher Kevin Joseph with climate scientist Hamish Clarke, co-founders of Science at the Local. With a grant worth $5,000 from Inspiring Australia (NSW), Science at the Local, the popular bimonthly science event held on Sunday afternoons at Springwood Sports Club in the Blue Mountains, will continue in 2016. In addition to presenting a full program this year, the organising team plan to also launch a series of science podcasts. Working with Springwood High science teacher Kevin Joseph, I set up Science at the Local in partnership with Springwood and Winmalee Neighbourhood Centres who jointly funded a pilot on the science of obesity in November 2014. Our first event attracted over 90 people and the Neighbourhood Centres then helped secure community funding from Westpac. This grant supported five events in 2015, with our most popular event attracting more than 140 people who packed out the Sassafras Room at the Bowlo to hear about forensic science and Aboriginal astronomy. Our plan for 2016 is to deliver a further five events every two months, with the first session planned for 13 March. Our topics will particularly target young adults, so at this stage we’re thinking about the science of zombies, sexually transmitted infections and hacking. Our Science at the Local podcasts will feature interviews with scientists and other bits and pieces. Under the Inspiring Australia strategy, small event grants are awarded to NSW Regional Science Hubs, which become focal points for science communication and engagement activities across their region. Science at the Local is part of the Blue Mountains Regional Hub, along with the Winmalee and Springwood Neighbourhood Centres. Science Hubs are all about bringing people together. So if anyone out there is planning science communication events in the Blue Mountains, we’d love to hear from you. Hamish Clarke is the co-convenor of Science at the Local and the Blue Mountains Science Hub. For more information about upcoming events follow Science at the Local on Facebook www.facebook.com/ScienceAtTheLocal and @SciAtTheLocal on Twitter.